Every year millions of people celebrate Valentines Day. For many it ranks right up there as a special day in the calendar …With a great deal of planning, preparation and thought to making it a memorable day for their loved ones. Awe we are a romantic lot aren’t we? And whilst that doesn’t necessarily mean gift buying (nor should it), according to Statista.com, us Brits are quite generous on that front. Oh yes, we do like to shop for Valentines, with (in 2016) Preston ranked as being one of the highest spending Cities in the UK (with an average spend of £53.36pp), closely followed by Milton Keynes (at less than £50 pp). Oh I so do love a statistic don’t you? Now with all that gift giving comes plenty of wrapping to be done and for those not using our professional wrapping services, I’m suspecting a few ideas might be handy? Happy to help! As ever our creative wrappings are ridiculously quick and easy with few materials needed…Mostly Plain paper (to wrap the gift), Patterened Paper (including an old book page) for the various hearts, tree etc. (The heart shapes themselves made by drawing around a template (or freestyling it) and some other bits and bobs as you’ll see…Including of course Double Sided Tape to hold everything in place! 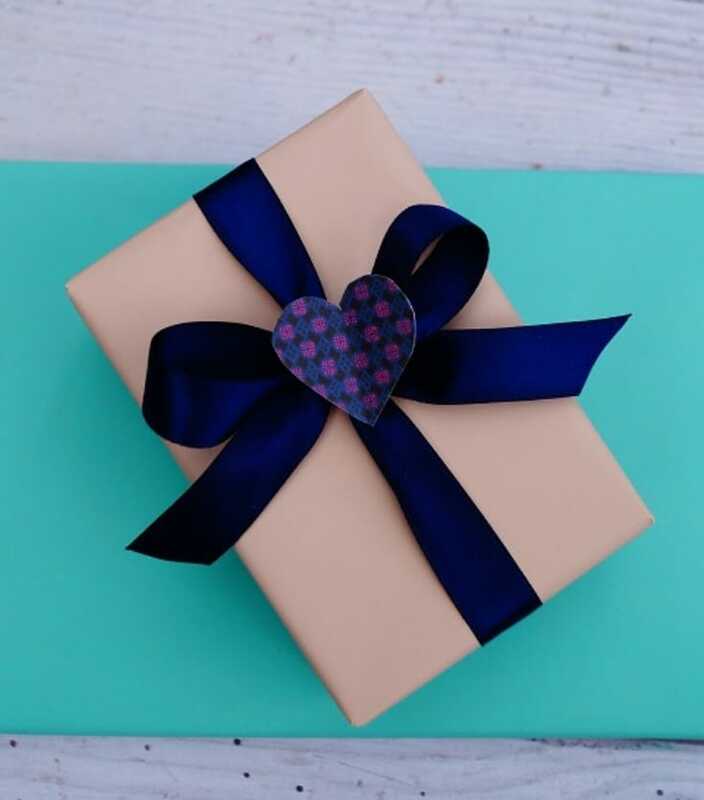 Then quicker than you can say ‘Roses are Red’ ….Voila…Your Valentines Gift Wrapping will be complete with brownie points well and truly in the bank! Materials used: Plain Taupe Paper, Navy Ribbon, Pattered Paper Heart & DS Tape. 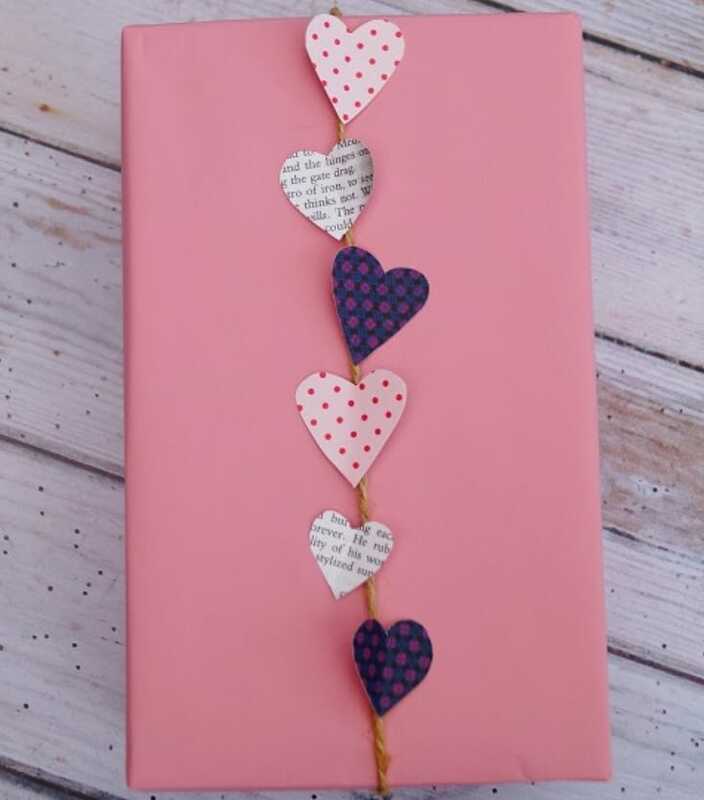 Materials used: Plain Pink Paper, String, Patterned Paper Hearts & DS Tape. 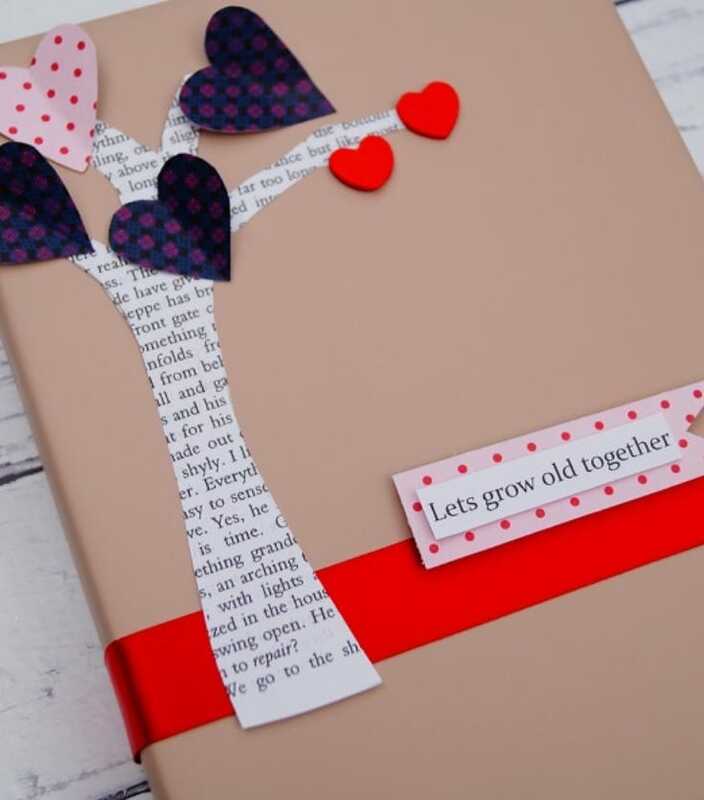 Materials used: Plain Taupe Paper, Patterned Paper/Book paper Hearts, Tree etc, Red Satin Ribbon, 2 Miniature Wooden Red Hearts, Printed Saying & DS Tape. 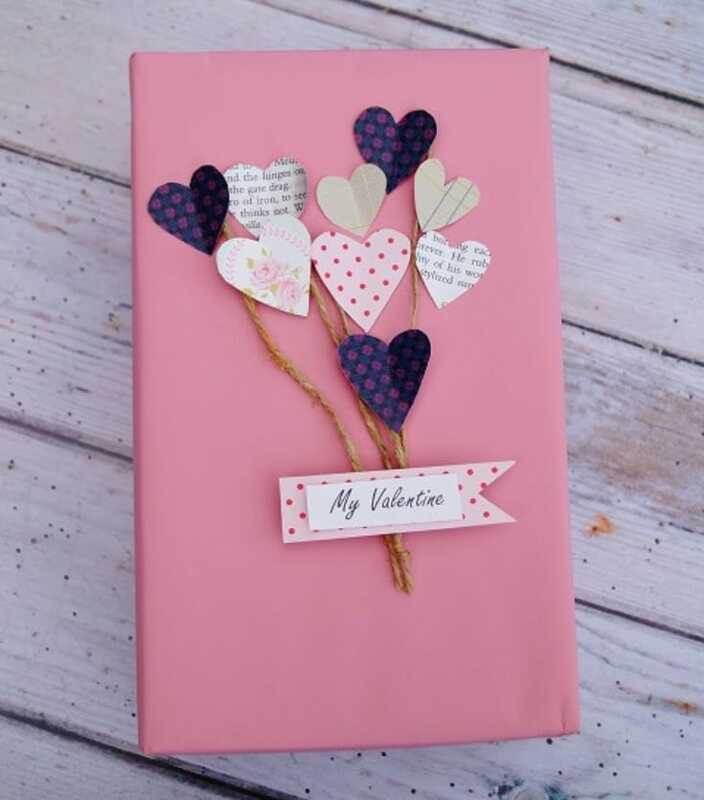 Materials used: Plain Taupe Paper, Patterned Paper Hearts stuck to Miniature wooden pegs, String, Printed out pictures with wording & DS Tape. 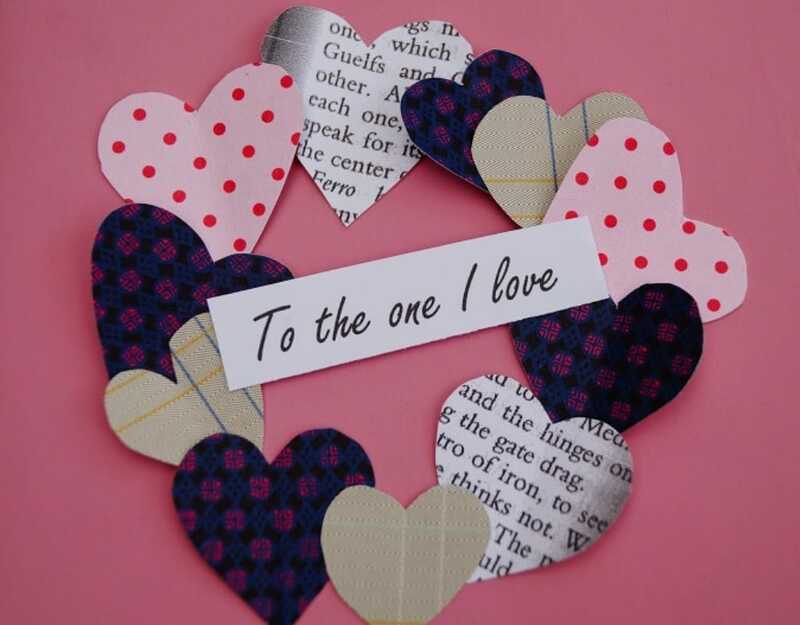 Materials used: Plain Pink Paper, Patterned Paper/Book paper Hearts etc, String, Printed Sentiment & DS Tape. 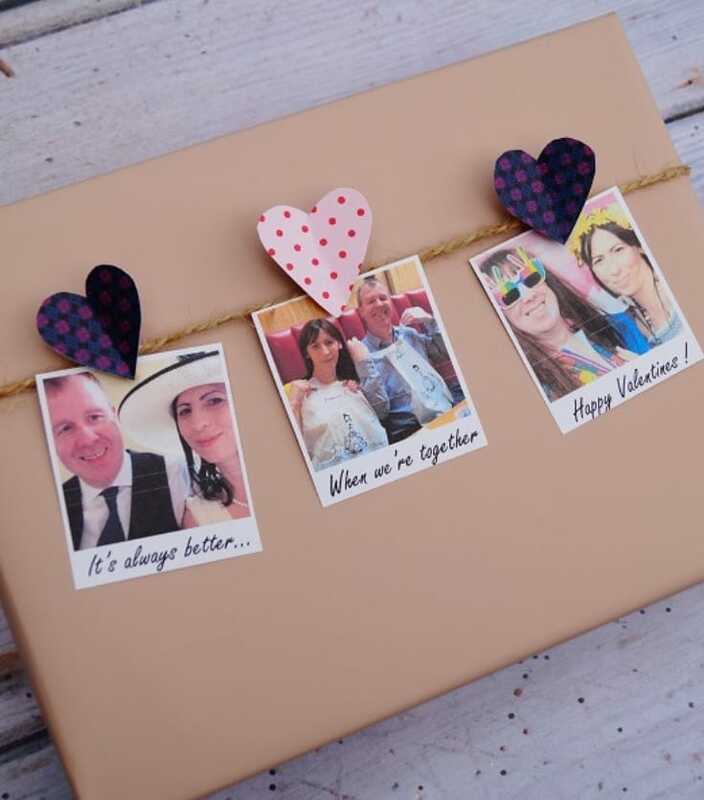 Happy Valentines Wrapping and if you’re inspired by our ideas then do please spread the LOVE by sharing with friends, on social media by pressing the buttons below or to pin to Pinterest simply hover over the image to see the icon.